Beautifully sitting centre of cul de sec cottage situated around tons of trees line. No neighbours totally private hot tub sitting on a huge deck. Bbq on site . Deeded access to water. Newly renovated and tastefully furnished. Almost everything inside of the cottage is brand new included stainless steel appliances. Satellite Tv, wifi, Napoleon propane fire place in the living room. Base board heater throughout the house for winter lovers. Fire pit on the site. We have a nice portable Ac in the living room that should cover approximately 600sqft . Addison to that we’ve fan in the room. Propane fireplace in living room and baseboard fireplace in the kitchen , bathroom and all the bedrooms. Please don’t turn on the baseboard heater if you are not using the rooms. Fire pit on site, there are soft woods around the property or welcome to bring your own dry fire woods. Indoor fire place for winter use in the living room. We give 2 towel set per stay, if you like more please request few days before your arrival. We’ve instant coffee, brewed coffee, Keurig, tea and hot chocolate. 3 stairs to claim the front porch. House is in same level all the room and the bathroom. It’s a great quiet private place to relax and make memorable stay with your love ones. We’ve all pot , pans and cutlery . Satellite tv, limited wifi, hot tub. Water access by few minutes walk marina/beach access to 5mts drive. 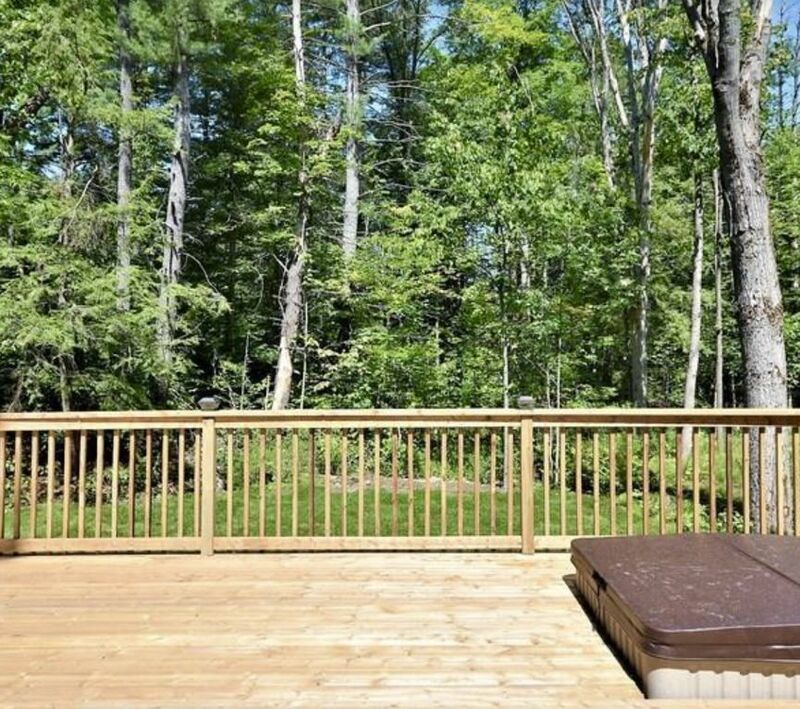 Huge deck to entertain and bbq on the deck. Fire pit right behind the cottage. Very private , tree line around cottage no neighbours. Ruth and Cameron are amazing hosts. They welcomed us upon arrival. Cottage is very clean, totally modern, warm cozy and fully fully equipped. 4 of us (and two small dogs) were incredibly comfortable. Ruth and Cameron were very quick to respond to our inquiries. We truly had a great time in this perfectly private, nested, cozy, clean, warm cottage. Oh and the hot tub = AMAZING. This place is a MUST for a winter getaway. We'll be back. Well run cottage with great hosts! Cameron and Ruth have made a great little place for people to get away. The house itself is small but very clean and is perfect for a small group who enjoys eachother. The hottub is certainly a perk. We couldn’t get over all the thoughtful little extras that were available. The only suggestion or thing to know for those who are going to stay here is bring an extra towel for the hottub (which we did). The communication before and after the stay was prompt and so helpful. The beds were comfy. The fireplace was cozy. The Monopoly game almost ripped our friendships apart but we made it through!! We will certainly look to stay here again. Thank you!!! Thank you Meredyth for rating us with 5*. Thank for leaving the place nicely as well. It was a pleasant experience to meet you and your friends and host. We provide bath and face towel 1 set for each guest per stay ( up to 3 nights) Any additional towels, we recommend guests to bring extra. Love to have you back.